we have had a very busy week this week slipping about in mud and snow and getting very cold and wet. We worked at three schools this week and of course this is when we needed 2 vehicles and the Skoda decides to pack up! 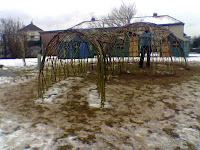 We made 2 domes and tunnels at St Mary's C of E Primary in Dalton In Furness. 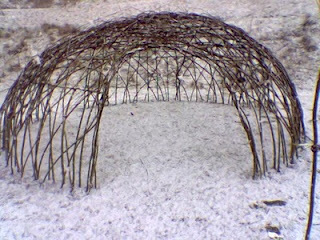 Every child in the school was involved in the constructions. 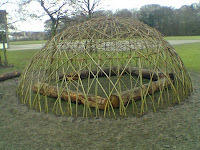 We made a dome in the nursery garden at Legh Vale Primary School, Haydock with year 4 children helping with the construction. 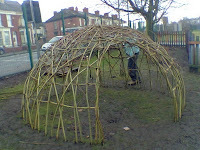 And we made another dome at Sacred Heart RC Primary in Liverpool with the help of very small assistants. We have been working every day this month making up for the lost time when the snow stopped us getting on with projects. Last week we were in the Newbury area. Our friend Peter Shelton the head at Lambourn Cof E Primary organised for us to go down to his school for 3 days and also to work on a family project for WOW family outreach centre at Hungerford. Before beginning work at Lambourn we spent one day working with the children at Cheam Prepatory School. 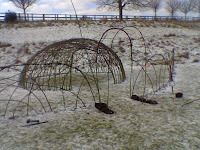 Despite the cold and snow showers we built a willow tunnel to go wth their already established maze and dome. 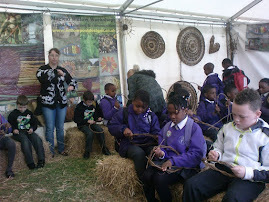 Lambourn School was a nice friendly place and the children were keen to work outside. 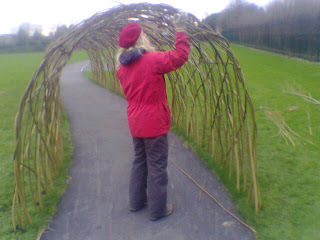 We built a dome and some nice living willow fencing. This was the start of an eco area for the school which will later also have a pond and a copse. The WOW Project is based at The John O'Gaunt School in Hungerford. 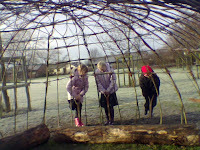 They have a nice secluded garden where we built a dome and tunnel. We have been working in schools in Morcambe, Marsk and Brotton this week. 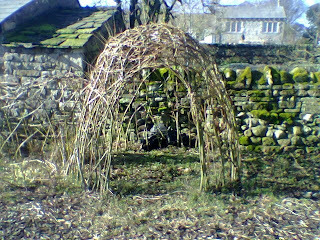 At Brotton we added a willow tunnel to the dome that we built a couple of weeks ago. We had to scrape the snow away to start making out the tunnel. 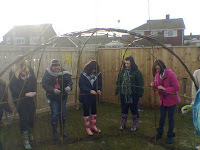 At Marsk we spent a day at Bydales Technology College building an arbour in the newly created garden, other students were planting fruit trees whils we were engaged on the willow work. 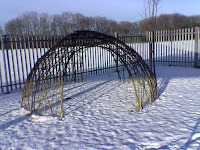 We made a massive living willow dome at Great Wood Primary School where we worked with all of the children in the school. We have been lucky with the weather and have not been rained or snowed on this week! During this cold snap we have been burning our scrap willow in our woodstove and saving on the central heating.